Bridal makeup dos and don'ts you need to know - right from the expert! You've got the dress sorted, now it's time to think about your bridal makeup. Whether you're hiring a glam squad to do your hair and makeup or watching lots & lots of YouTube beauty videos to DIY your own makeup, there’s always something that can go wrong at the last moment. To help you out, we asked the industry’s top-rated makeup artist - Arshis Jhaveri to give some bridal makeup tips to you brides-to-be! Check out these 12 bridal makeup tips and tricks to make sure you look flawless on the most important day of your life! Arshis recommends all his brides to start drinking 2 glasses of lukewarm water 3-4 months before the D-day approaches! Start eating healthy way before the wedding itself, because a healthy skin doesn't come overnight. No matter what skin type or issue you may have, your body craves water. Drinking water is great, but eating food that is naturally hydrating is the best! Especially during summers! So, try to incorporate watermelon, cucumbers, tomatoes and kale. You should always make sure you have enough light in your bridal suite, if natural light is not an option. 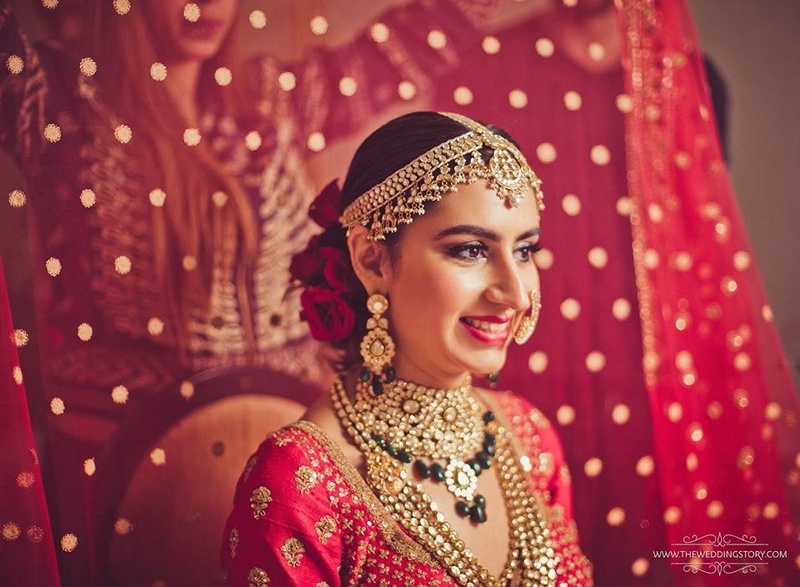 This is because, when you step out, dolled up in your bridal look, your makeup might look different in that light, and most often too light or too dark. Especially for brides getting married in warmer climates, consider using as many oil-free products as possible — primer, moisturizer, foundation, etc. — and keeping oil-free blotting sheets on hand. Also, it's important to keep in mind the climatic conditions for your bridal hairdo too! For example if you are getting married in Goa, with a beach setup then you cannot have wavy curls as a part of your hairdo. Why? Well because your hair might be too frizzy and make you look like you are battling your worst hangover. A bun on the other hand will do total justice to your bridal look! The secret to making your makeup last longer is - prepping your skin right, rather than the application of makeup itself! The skin that has not been prepped properly will be unable to hold makeup beautifully. You know the makeup that starts to melt and disintegrate with all the sweating and dancing is all because the prepping was not right! So, make sure to start with a clean face. Wash your face and use a toner or cleanser to completely get rid of all the dead skin, dirt or makeup residues. Moisturize your face (under your eyes as well) so that your skin is hydrated. The camera will blow you out a lot in the pictures. So, it’s recommended to put on a little more makeup than you’d apply normally, as the camera and lights will tone down your makeup. When you smile, the apple of your cheek pops out. Place your blush right there and blend into your temple — this will make it look like you're naturally flushing. One must never underestimate the importance of well-defined brows! It really frames your eye and finishes the whole picture. Hair coloring is good as it definitely gives a structure to the whole look. Although Arshis recommends all his brides to keep the hair hydrated post coloring and take very good care of it. Also, if you are opting to colour your hair for the D-day, then make sure you opt for long lasting colours so that it lasts till your whole honeymoon period. Your wedding day will be all smiles, kisses, food, drinks and even a few happy tears. So, basically - a giant love fest when even the most well-applied makeup is bound to fade. Don't expect your initial makeup application to last eight hours, and pack a touch-up kit with the essentials — blush, translucent powder, cotton swabs, and tissues — and stash it in a bridesmaid's clutch if you are not keen on carrying it yourself! Yeah that’s his last piece of advice. Enjoy your wedding and every moment of it as it’s one of the most important days of your life and you’ll cherish these moments forever!